The search engine optimization is the methodology that improves the visibility of a website in the organic results of different search engines (such as Google or Bing). It is also often named by its English title, SEO (Search Engine Optimization). It is the design of web pages or restructuring of existing pages according to standards that help organic positioning in search engines. The SEO specialist will write the original content with a limit of 250-500 words per page. We will write about topics relevant to your product or services focused on attracting the public in search of this information. Each month the SEO specialist will edit the content on your website to optimize it according to high volume keywords. 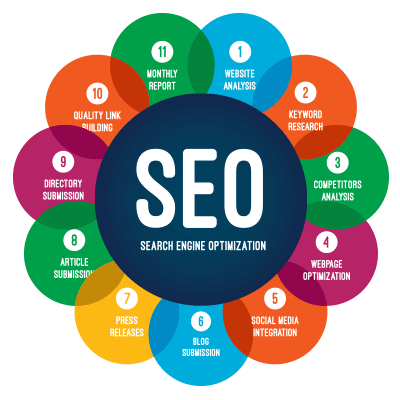 Using the Search Engine Optimization (SEO) tool in English Search Engine Optimization allows search engines to naturally index a Web page in the top positions of the search results. Approximately 90% of Internet users use search engines to find information. About 85% of people using a search engine, such as Google, only review up to the second page of results. There are potential customers looking at search engines, and if your website is not positioned, those customers are likely to go to other sites, such as those in the competition. If you are interested in the best optimization results, please contact Mega Web Design, the best seo company in India, and one of our specialists will assist you.